If you’re like most people who care about their complexions (and who doesn’t?) you’ve likely invested in a variety of products to improve your skin. However, did you know that the number-one factor for beautiful, smooth, radiant skin comes not from what you put on yourself, but what you put in yourself? Many people believe that diet is only important in terms of weight management; but the truth is, the old adage “you are what you eat” rings particularly true in the arena of skin care. What you eat directly affects the face you present to the world—be it glowing and youthful, or dull and aged. Medical professionals are in agreement that many undesirable conditions such as psoriasis, eczema, and acne can often be linked directly to diet. Skipping crucial nutrients can result in dry or sallow-appearing skin. However, conversely, the healthier your diet–the better your skin will look! What should you eat in particular to improve or maintain a great complexion? Let’s look at a list of the top 10 foods you can add to your plate for better-looking skin. It’s not a food per se, but always be sure to drink plenty of water, both to hydrate your skin (and entire body) and keep your system running smoothly. Water helps the body rid itself of toxins, as well as assists in an essential function: Sweating! Sweat is the natural way to clean your skin, so drink up and get moving. Salmon is rich in essential fatty acids, which are the element responsible for healthy cell membranes. Why should you worry about your cell membranes? Strong ones act as barriers to harmful elements while holding moisture in and making sure nutrients go in and out properly. Feed your cells with a lunch or dinner of fish! 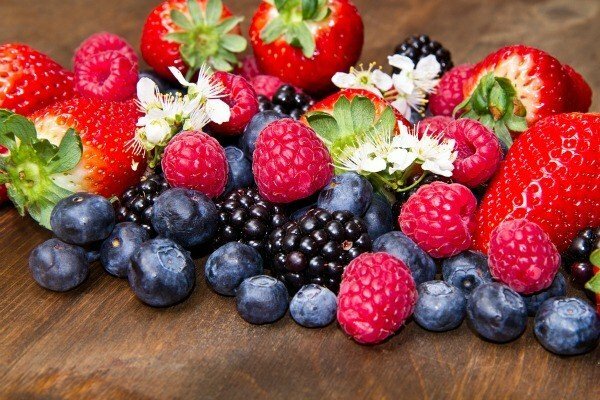 Rich-colored fruits such as blackberries, blueberries, strawberries, and plums are loaded with antioxidants and phytochemicals, which protect your skin from free radicals that cause damage and aging. Eat them daily and you may appear younger much longer. Like salmon, walnuts have plenty of fatty acids to build up your cells. And almonds are packed with Vitamin E, which combats those nasty free radicals as well as helps your skin hold in moisture. Looking for a tasty way to eat those nuts and berries? How about stirring a handful into a bowl of oatmeal for a hearty breakfast or filling snack? Oatmeal is chock-full of things that are super for skin health. In addition to fats and proteins which you are likely familiar with, the cereal has saponins (natural cleansers), polyphenols (with anti-inflammatory qualities), and beta glucan (which holds water in). Not a fan of oatmeal? You could throw your fruit and nuts into a delicious low-fat dairy product instead, if that’s more your thing. Experts assert that optimal health of skin cells is dependent on dietary vitamin A, which you can get a nice dose of from milk, cottage cheese, or yogurt. Are you a salad fan? Good news: Green leafy vegetables such as spinach are also fantastic resources to get your vitamin A. Red and orange veggies are great, too, since they have beta-carotene that our bodies convert into vitamin A. You always knew they were good for you, but bet you didn’t know how good overall! Another green food to consider? Green tea. Recent studies have shown the beverage can reduce the risk of damage from ultraviolet light, thus reducing the risk of skin cancer. Sip away, just go easy on the sugar. Whole grains are much better for you than processed ones, but not just for your waistline. Grains such as buckwheat and wheat germ contain skin-friendly nutrients such as biotin, which helps you process fats and keep your skin looking dewy . Whole-wheat bread has selenium, which is thought to help combat the type of skin damage that can lead to cancer. Healthy oils used for cooking or added to foods can not only make them taste better, they can make you look better. Keep your skin lubricated and lovely with a good-quality oil in your recipe repertoire. Shop for those labeled cold pressed, expeller processed, or extra virgin. Don’t go overboard, however, as they’re high in fat and a little goes a long way! If you’re tempted to try out one of the trendier diet plans circulating these days, be mindful that some may have negative effects on your skin. While going gluten-free or attempting a Paleo plan (in moderation) can sometimes help with various skin conditions, other regimens such as extreme low-carb, detox, or raw food can work against your complexion. Getting too few calories or severely restricting whole food groups can result in dry skin, wrinkles, undereye circles, and other undesirable side effects. Eating too much meat can also increase the body’s production of free radicals, which can interfere with your normal cellular process. The takeaway (or, takeout, as it may be)? Everything in moderation is always best.